Hitler's popularity varied considerably over time. 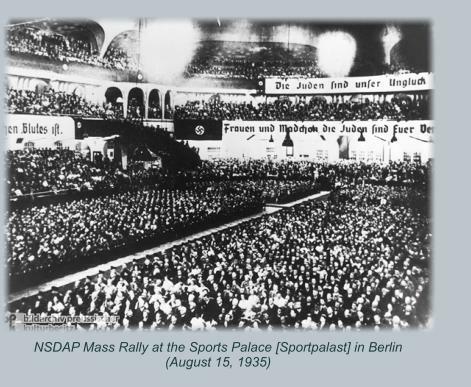 At the time Hitler was appointed chancellor in January 1933, the Nazi party had obtained just over 33% of the total vote in the most recent election of November 1932. This made it the largest party in the German Parliament with 196 of 584 seats—but not the majority party. The next largest party, the Social Democrats, had 121 seats and the Communists 100 seats. Together, therefore, the two leftist parties were more popular than the Nazis, while the splintered centrist parties together had 134 seats, or more than the two leftist parties separately, but less than the Nazis. I'm going into so much detail because far too many people seem to believe that Nazis won overwhelming victories in free elections. This is not true as the above figures show. Furthermore, the elections in November 1932 recorded a significant drop in Nazi support compared with the elections that had been held in July 1932. After Hitler came to power, there were no further elections and therefore no reliable means for measuring his personal popularity with the populace. Remember from the summer of 1933 onwards there was no free press, no opposition parties, and no independent trade unions. In short, there was no public means of voicing dissent or discontent. Nevertheless, there is a strong consensus among historians and eye-witnesses that Hitler's popularity soared in the early years of his regime as he delivered on his economic promises of eliminating unemployment, stabilizing the currency domestically while at the same time ripping up the humiliating and hated Versailles Treaty with impunity. 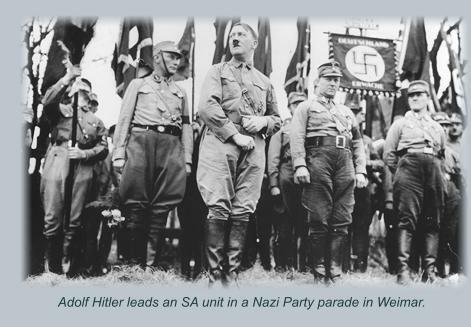 Hitler's popularity then fell during the tensions leading up to the Sudeten Crisis, because the population feared war, but when Hitler again got away with aggression without paying a price, his popularity reached new heights. The same thing repeated itself a year later. The Germans were terrified that the Western Allies would fall on their Western frontier while the Wehrmacht was fighting in Poland, but when they didn't and Poland was defeated in just weeks with few casualties, Hitler's popularity bounced higher still. Nevertheless, it is fair to say that at no time was he more popular than after the stunning victory over France in just six weeks in May-June 1940. The defeat in WWI and the vindictive policies of France which followed had traumatized the Germans. They were terrified of a repeat of the bloody stalemate that had characterized most of the First World War. When Hitler delivered a victory over France in a matter of weeks, it was like divine providence to the vast majority of Germans—and Hitler seemed invincible and infallible. After that they trusted him no matter what he did. It was truly not until the German Army got bogged down deep inside Russia, casualties started to mount and the Allied Air Offensive started to bring the war home to Germany that the mood in the general population shifted. Stalingrad was the most critical turning point, but it should not be forgotten that the Wehrmacht appeared to recover from Stalingrad and in the summer of 1943 new victories followed, so Hitler's popularity was partially restored. It never really recovered from the defeat at Stalingrad, however, and meanwhile the Allied bomber offensive ramped up, causing increasing casualties and hardship. Nevertheless, it is a point of very heated —often bitter— debate among historians just how much the mood had swung against the Nazis by July 1944. There are those who argue that had the Coup been successful, the majority of people would have been relieved. Most historians disagree and feel Hitler still had the majority of the people behind him in July 1944. The point is moot. Even if "a majority" were on the side of the Resistance in July 1944, there would have been a very substantial minority —tens of millions of people— who were fanatically loyal to Hitler even then.